FileRescue Professional is an easy-to-use yet powerful software utility designed to restore accidentally deleted files and folders. It allows you to recover files that have been deleted from the Recycle Bin, as well as those deleted bypassing the Recycle Bin (e.g. Shift-Delete). 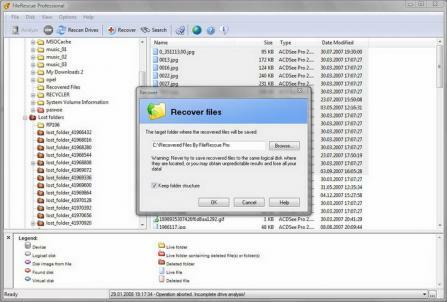 It will also recover files deleted due to virus attacks or software faults. 100% FREE to try. FileRescue Pro works under Windows NT/2000/XP/2003 operating systems and supports FAT12, FAT16, FAT32, NTFS and NTFS 5 file systems. Manage your files with this tool.